Many colorful characters lived in and around the Malad valley in days gone by, and every once in awhile an unusual story comes to light. 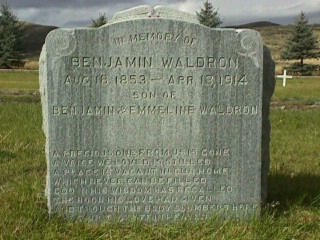 I recently heard an interesting tale pertaining to Benjamin Waldron, a man well known for his abilities as a businessman in early Samaria, Idaho. However, before Ben became a merchant, he was a farmer by trade. 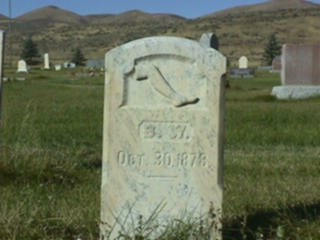 It seems that when he was about 25 years old, in the fall of 1878, he was out harvesting with a horse-powered thresher. Somehow, his leg got caught up in one of the rods in the machinery and was severely injured. Nat Waldron, a relative, states: "They hooked up a team of horses to a wagon and rushed him to Logan as fast as those horses could run." For awhile it seemed doubtful that Ben would live due to the loss of blood and the severity of his leg injury. Doctors found there was no way to repair the leg and it was decided to amputate the limb. After the operation, Ben asked that the leg be buried which was done, according to his wishes. The burial plot for the leg was marked with its own tombstone on the east side of the Samaria Cemetery and it bears the engraving of a leg with the inscription: "B.W. October 30, 1878.